For me, accessibility was a game changer in thinking about the purpose of design. As a starving musician, I stumbled into design in the course of trying to put food on the table. Without a design education I was never quite sure of what design was all about. As an interaction designer, I was torn between delighting the eye and quietly helping people on their way—both visible and invisible, imposing and encouraging, shouting, “Look at me!” and murmuring, “You’re on the right track.” I muddled along, confused. In 2001 I attended a Nercomp conference on Web Accessibility and presented a talk called “Practical Accessibility in Web Page Design.” This was my second presentation on the topic, the first a few months earlier at another higher ed/IT conference. Web accessibility was new to me and new to higher education. Dr Neufeld was a compelling storytelling. I felt his frustration and distress, and worried with him about keeping up with such compromised access to primary materials. I also felt worry transform into delight at the world of opportunity presented by electronic texts, and software to read them. And while his access was much improved by electronic documents, he had stories to tell of obstacles he encountered, such as image-based PDFs. I felt discouraged by obstacles that could so easily have been avoided—opportunities that were so close, yet still so far. Empathy is a powerful learning tool. Dr Neufeld told stories in such a way that encouraged others to step into his shoes and broaden their knowledge and understanding of the world. From Dr Neufeld I learned that the purpose of design is delivering content and functionality, without obstacles, to as many people as possible. I’m reading Graham Pullin’s book, Design Meets Disability. 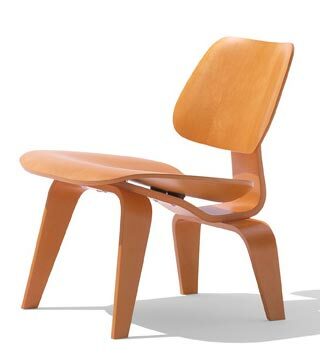 He starts out with a quote from Charles Eames: “design depends largely on constraints.” Charles and Ray Eames designed, among other things, the iconic molded plywood chairs manufactured by Herman Miller. I love this quote. Much of the work of a web design professional seems to be about explaining and demonstrating the constraints of digital environment. There’s something about the plasticity of digital that leads to an “anything is possible” mentality. After all, in software development most everything is a simple a matter of programming. And though this expression is intended to be ironic, in many ways it is true. Much is possible, given the necessary time and knowledge. But just because something is possible doesn’t mean it’s appropriate, given the constraints of the environment. Many factors constrain the form of a chair: its materials, variability in human form and function, its physical and cultural context. These are broadly understood by designers and consumers. For the most part, even the most innovative designs produce chairs we can sit on. The factors that constrain digital designs are less well understood, in part because they are in a constant state of flux. Also, digital design is a new profession, unregulated and un-credentialed, and lacks a shared vocabulary and common understanding of the requirements of a safe, stable, and accessible environment. The resulting disorder produces unnecessary constraints, one of the more vexing of which is variability. I am currently working on an HTML email, nesting tables just like old times, and am dismayed by the variation in rendering across clients and platforms. When software developers do not adhere to constraints, such as the need for consistent rendering, web designers end up spending much, if not most, of their time creating designs that will survive variable platforms. So I should qualify my endorsement of constraints by saying I enjoy working with real constraints, like a limited font selection and variable window widths. I don’t enjoy wasting time dealing with inconsistent rendering. The discipline of design is in observing and working with constraints to produce an experience that people can settle into and enjoy, with ease and comfort. The sooner we can bring discipline and respect for constraints to the digital environment, the better. I’m just gearing up to start work on a new book. The book is called Universal Design for Web Accessibility. Whitney Quesenbery is my co-author, and Rosenfeld Media is the publisher. I am honored and grateful to work with Whitney, and to have the confidence of Lou Rosenfeld and the readers who reviewed our proposal. This will be an important book and I am eager to get started. In many ways I have been working on this book since my first presentation on web accessibility in 2001, 10 years ago. I had been hearing talk of how the design of website elements could create barriers on the web, similar to staired entryways and revolving doors on buildings. I had been building websites guided by concerns other than accessibility. This was at a time when designers like me, who were concerned with layout and typography, used the rudimentary technologies available to coax (or hack) out well-designed sites. The code beneath the designs was not pretty, but the websites were. I was proud of my resourcefulness and my designs – until I learned more about accessibility. I accepted the invitation to present on accessibility primarily as a push to learn more on the topic. I learned how people with disabilities use the web. I learned how web technologies, when used according to standards and guidelines, open up access to a world of opportunities. And in the process of learning about web accessibility I grew into my role as a designer. By understanding the impact of my decisions, I assumed responsibility for my work that goes much more than screen deep. Since then I have been looking for ways to provide attractive designs that transform elegantly for different users in different contexts. I have found the universal design principles that guide the best accessible designs in the built environment to be a useful framework for designing digital access. I have also looked to architects and builders to understand how the profession has taken on responsibility for access requirements. Whitney and I have high hopes for this book. The user experience profession will be asked to absorb responsibility for accessibility compliance. We want our book to provide solutions that are both practical and inspiring. And we want to establish a universal design framework for web development that will give rise to accessible design solutions. Please help us by participating in the creation of the book. Our book website will be very active during development, and we will follow a reader-centered authoring process. Tell us what you need, respond to our requests for feedback, send us inspiring examples. Let us learn from you! I recently took a trip that involved multiple hotel stays. One of the hotels reminded me of a certain type of internet experience. The hotel described itself as a luxury hotel, and indeed it had the amenities of luxury—the plush white robes waiting in the closet, the thick towels, the Gilchrist & Soames toiletries. However, only one burner of the kitchen stove was functional, the television played only snow, and the pillows were without pillowcases. And the fundamental structure of the building itself was flimsy and old. Having committed to the hotel, both financially and logistically, I tried to make it work. I made my coffee using the one working burner. I watched movies on my laptop. I found pillowcases. And I tried not to look too closely at the stains, dirt, and cracked paint. This worked for about four days, at which time I cancelled the remaining three days of my reservation and left. Satisficing ultimately wore me down, to where I dreaded returning to my room—plush robes notwithstanding. As a web designer, sometimes my job is to dress up poorly conceived and architected websites and web applications—also known as putting lipstick on a pig. Perhaps this self-awareness is part of what made my hotel experience so uncomfortable. It was like I was living inside one of my less glamorous projects—a bit like Being John Malkovich, but without the humor. If the basic framework is a pig, lipstick does not a luxury experience make. My guess is that this hotel has a high bounce rate, with visitors checking in, staying a few nights, leaving or leaving early, and never returning. They would be better served spending their luxury dollars on providing a solid baseline of service and cleanliness, and making their facilities fully functional. Who wears bathrobes, anyway? The same holds true for web experiences. A clean interface that supports basic usability and functionality wins out every time over a luxurious yet buggy design (fortunately, there were no bugs). The experience served as a good reminder. For interaction design, I need to focus on the essentials and do them extremely well, and resist the urge (or the push from clients) to reach for the lipstick until I’m sure it’s not for a pig. The National Federation of the Blind (NFB) recently raised the possibility of civil rights violations arising from the use of Google Apps for Education, and asked the Department of Justice, Civil Rights Division to investigate. In their March 15, 2011 press release, Adoption of Google Apps Program Discriminates Against the Blind, they claim that both New York University (NYU) and Northwestern University, along with several Oregon public schools, have committed civil rights violations by utilizing these applications that have “significant accessibility barriers for blind people” to deliver email, calendaring, and collaboration tools to their students and faculty. In following the story I discovered that NFB has devoted resources to preparing (captioned) videos demonstrating the types of barriers encountered by screen reader users in using these tools. As a long-time advocate of accessibility, who has tried countless methods for raising awareness about nonvisual access to webpages, this video collection is a goldmine. The videos illustrate both the challenges of nonvisual access, but also the ease of solving these challenges using good coding and design practices. The issues demonstrated using Google as an example are transferable (unfortunately) to many—maybe even most—web-based applications. Developers should view and learn from these videos, and avoid making the same mistakes. I have long admired NFB for their work in ensuring equal access for nonvisual users. To admiration I now add my gratitude for providing exceptional content that can be used for education and awareness-raising by accessibility advocates, and to make real the barriers as well as the solutions for the people who code the pages. 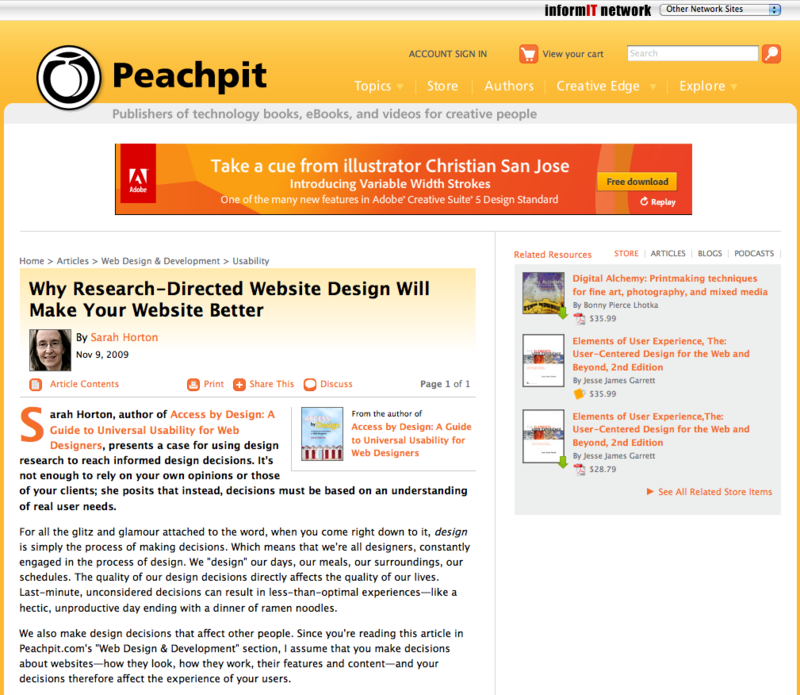 Peachpit is one of the most well known publishers in the design and technology industry. In particular, their New Riders imprint is the stomping group for the field’s most prominent experts, through the “Voices That Matter” series. I have had the honor and privilege of publishing a book, Access by Design , and many articles under the Peachpit masthead. My most extensive series of articles has been for Peachpit’s Web Design Reference Guide. Alongside web gurus such as Andy Clarke, Robert Hoekman, Jr., Molly Holzschlag, and Dave Shea, I published 20 articles for readers interested in learning best practices for web design. For the most part, my articles focus on usability and accessibility concerns, including usable forms, flexible layouts, and data tables. More recently I published two articles with Peachpit on user-directed design: one on making the case for user research and a second describing the components of a project charter. In the spring of 2002 I had an idea for an article. For several years I had inhabited an office in Berry Library at Dartmouth College. The office was nice—large window, high ceiling, new construction. But outside the window was a brick freestanding wall that obstructed my view. I tried not to let it rankle me, but every time I had a visitor she or he would make some comment like, “Nice view.” Thanks. I heard through some source that the wall had to be that height—something to do with the golden ratio and classic proportions. But the reality is that every window on the first floor of the north facing side of the building looks out on brick instead of the beautiful New Hampshire landscape. And to top it off, the wall is purely aesthetic—it has no structural purpose. At the time I was getting more involved in web accessibility. I found myself arguing against elements, such as Flash and dropdown menus, that were unnecessary and could potentially create barriers. That’s when I finally found a purpose for the wall outside my window. I could use it as an illustration of how design decisions can result in unnecessary barriers. No one who visited my office ever praised the wall or saw its value despite the drawbacks. If I created a parallel using this unnecessary and obstructive wall, perhaps people would arrive at the same conclusion about barriers on the web. The idea had traction. I wrote a rough draft and pitched it to an editor at the New York Times who had given Web Style Guide a favorable review. She connected me with the editor of the New Economy column and I was off to the races. The article, New Economy; Eye-popping graphics can spice up Web sites, but they also create barriers, was published in paper and online on June 10, 2002. This article is one of my proudest accomplishments. The writing came together nicely and went out to a broad readership. I was able to raise awareness of the barriers facing people with disabilities at a time when web accessibility concerns were not well or widely understood.